The delicious fragrance of our Red Candy Apple Scentsy Bar will remind you of your days at the fair. Bursting with tart Macintosh apples, red raspberry jam, sweet red berries and strawberry milk, with notes of brown sugar, taffy and cotton candy, it’s a delicious treat for your nose. 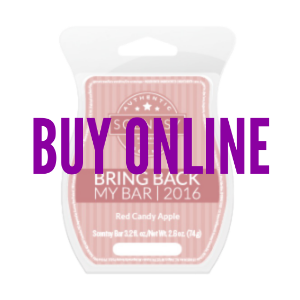 Red Candy Apple Scentsy Bar refill is available online as a Bring Back My Bar, and only for a limited time. Simply add 4-5 cubes of Red Candy Apple candle wax to your favorite Scentsy wickless candle warmer, and enjoy delicious sweet fragrance. Twice a year, Scentsy customers vote online for their favorite discontinued scented bars to return. Once votes are in, Scentsy brings back the top 20 Scentsy Bars that become part of the Bring Back My Bar campaign, which only lasts for one month. Our long lasting Scentsy Bars, including our limited edition Red Candy Apple Scentsy Bar refill, is just one of over 80 fragrances to choose from. Scentsy Bars have a very low melting point and are best experienced when used in an electric Scentsy Warmer. Each Scentsy bar is scored to easily break into 8 cubes, and contains 3.2 fl. oz.